Think of a professional athlete; they train during the off-season to keep in shape but also to prevent injury when they get back to the regular season. Though our pets may not be high performance athletes, the same concept applies to them as well. Keeping your pet active during the winter months will help to keep them happy and healthy. To help with this goal, we’ve put together a list of tips for winter fitness. With the temperatures as bitter cold as they have been already this winter, we don’t really want to go out for a long walk with our pets. Instead of taking a long walk, try going out for multiple short walks each day. For example, if you usually go out for one 30-minute walk per day, try taking 3 ten minute walks throughout the day. This helps to break up the activity as well as limiting the time we have to spend out in the cold. If the snow is light and fluffy, it can be a useful tool for fitness. The lighter and fluffier snow can act as a cavaletti exercise and/or an uneven surface exercise. Both of these exercises work on improving proprioception (paw placement), body awareness, and balance. Moving through the snow can be very difficult. Just be sure that your pet is safe. Keeping them on a leash and close to a shoveled/cleared area can prevent them from getting so far into the snow that they become too fatigued to get back out. This should be very slow and controlled walking. 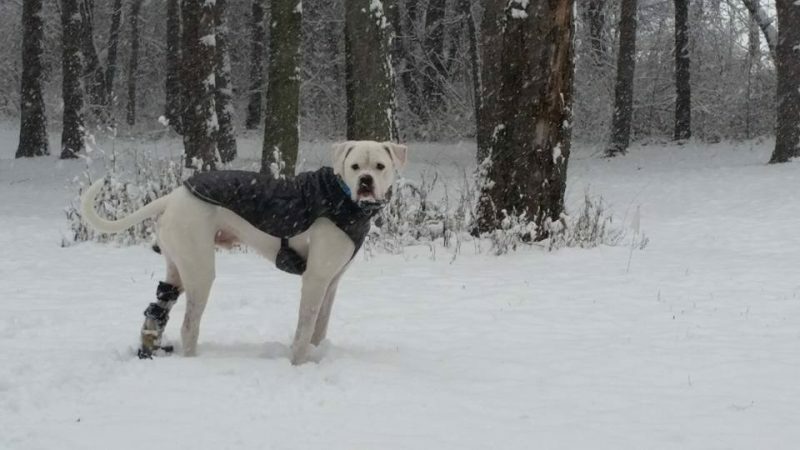 Letting your pet bound through the snow is not a structured or targeted way to exercise them. If your pet seems unstable or uncomfortable in the snow, this may not be an appropriate exercise for them. Clearing out a space in the basement or garage can provide more space for activity as well. (It also helps you get a jump start on your spring cleaning!) Having an open area allows you to accomplish the exercises you would normally do outdoors, but perhaps on a smaller scale. If your pet loves to fetch, try rolling a ball across the floor instead of throwing it. Tug-of-war may also be a good activity as long as your pet doesn’t get overly excited. Also, remember to tug side-to-side, not up and down. For a little more mental stimulation, try hiding your pet’s favorite toy around the house and having them find it. You could also use treats but make sure you’re using a low calorie treat or breaking one up into smaller pieces. You could also hide yourself to play hide-and-seek with your pet. Another option to increase activity during the winter months is a dog fitness class. We offer 30-minute fitness sessions here at Pawsitive Steps and we would be happy to create a custom plan that will work for you and your furry companion. The paw pads are sensitive and can dry out and crack just like your skin. Protect them by putting boots on your pet’s feet or using a paw wax (ie: Musher’s Secret). Remember to keep your pet hydrated. Cold and dry air can dehydrate us. Provide fresh water for your pet while they are outside. For our short-haired fur babies, they may need a little help to stay warm. A jacket or sweater may be a good option for them. Above all, make sure that you are keeping an eye on your pet. Look for signs of being too cold, such as shivering, whining, slowing down, and holding up a paw. If you see any of these signs, it is time to go inside and warm up. It is tough to stay active in the winter. Most of us would rather stay inside, cuddled up on the couch letting the day go by. But staying active not only helps our physical well-being but it improves our mental well-being too. The same is true for our pets. Play hide-and-seek games to keep your pet’s mind engaged. Sign up for a fitness class for dogs. Go outside for short periods of time throughout the day and use the snow to your and your pet’s benefit. Just remember to stay safe and keep a watchful eye on your furry friends. 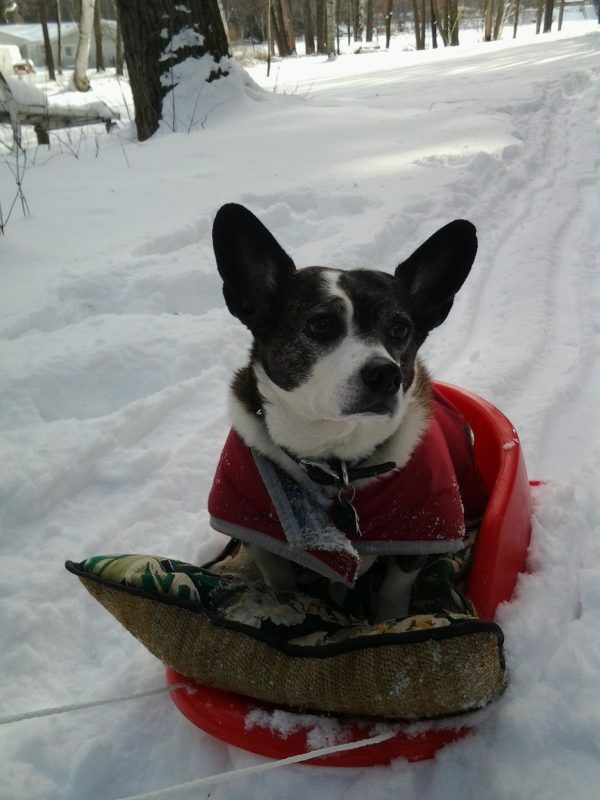 Whether you stay indoors or venture outside, have fun with your pet this winter and stay active! Previous: 1.21 Gigawatts?! Great Scott!